A Better Way to Pamper Your Horse! “Equine Aqua Comb” – Greatly reduces your horses wash and dry times! The horse’s mane, tail and hair will be cleaner and shinier than ever before! Your horse will love the deep hydro massage and its mane, tail and hair will be healthier! Retailers – Order Your Equine Aqua Combs Today. Deep cleans mane and tail to the roots; helping to eliminate Fungus, Sweet Itch and Skin conditions! Used with Lucky Braids All In One Shampoo www.luckybraids.com deep cleans and preps mane and tail for braiding. Manes, tail and large feathers will benefit from Aqua Combs ease of use, fast and full deep cleaning experience. The combination of the water spray and pic- comb design spreads the hair allowing a deep cleaning from the skin level out and a faster drying time (Requires only one scrapping to dry) which helps fight the initiation of fungus and skin conditions. 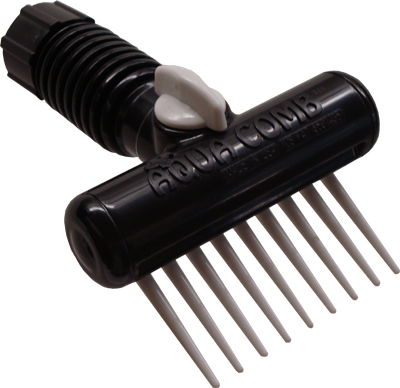 Aqua Combs used with your favorite shampoo are great to prep your show horse for close clipping. Gives a relaxing deep hydro massage that is so good that most horses become a willing recipient of a bath! Because the comb allows the spray to reach the skin directly the Aqua Comb works remarkably well at instant cool downs after an intense workout! Cleans a white horse in washing whiter than when you do a normal triple cleaning! Reduces wash time by 30% using less soap and only one scraping to dry your horse. 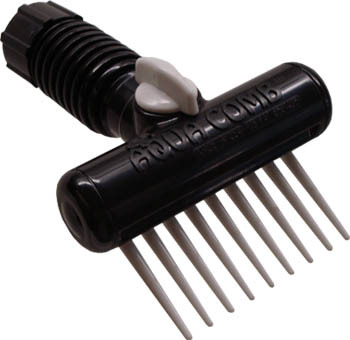 1) The Equine Aqua Comb also works well on cows, pigs, goats etc. or any other furred animals. 4-H kids that show their animals will find that they look better and place higher in competition. 2) Ranchers or anyone selling livestock at auction will see higher bids for their animals because they look better and are livelier in the arena! 3) All furred rescue animals get extreme benefit from the Aqua Comb’s combined deep massage and wound therapy. Recovery times are accelerated and the animals appearance and mental state improve faster, making quicker placement times possible! 2) 100% made in USA /Sarasota, Fl. Raw materials, assembly & packaging. 3) Helps eliminate fungus and skin conditions. 4) Great prep wash for body clipping or braiding. 5) Detangles mane, tail and large feathers in minutes. 7) Wash in 30% less time using less soap. 8) Very fast drying time! Deep cleans mane to roots helping to eliminate fungus, sweet itch and skin conditions! Ramiro Bay is a hunter show horse that is body clipped. He still benefits from the deep powerful cleaning action of the Aqua Comb! For hunter show horses like Ramiro; the Aqua Combs deep hydro massage refreshes it’s energy level and is great for instant cool down after an intense workout! Ramiro getting his tail deep cleaned which helps eliminate Fungus and tail rubbing. Notice that the powerful 3 inch wide that shoots 30 Feet is completely absorbed into the Tail! The detangling comb also makes tunnels that allow entry for the water to dislodge and remove sand, debris etc. from the tail core! 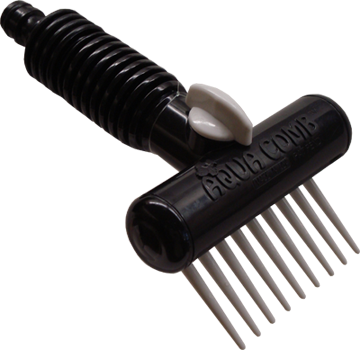 Our Trademarked and Patented Equine Aqua Combs are a real game changer in the horse industry! With one washing your horse will shine and look better than you get from a year’s worth of supplements. With as little as three washings you will see Fungus, Sweet Itch, Ring Worm Scabs and other Skin Conditions going away! Most horses that instinctively hate to be washed will embrace the new deep hydro massage they get from the Aqua Comb. Horse owners will like the 30% reduction in washing time and faster drying means less issues in cold or wet weather! All horse types and sizes will benefit from using Aqua Combs. You will save time, money and your horse will look, feel and be healthier! Equine Aqua Combs offer a new way to organically improve your horse’s life and give you an edge with your competition sport horses! Interested in the Equine Aqua Comb?